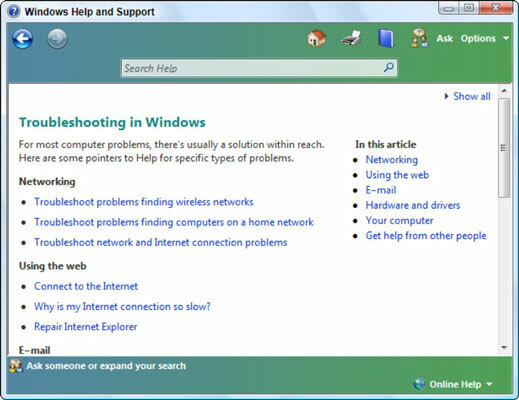 Troubleshooting problems in Windows Vista is a breeze when you use the troubleshooting feature in the Windows Help and Support Center. The Help and Support Center contains a wealth of information about Windows Vista, but when something isn’t working, it’s easy to get lost in the abundant offerings. The troubleshooting tool helps you narrow down the possible causes of the problems and leads you directly to the solutions. The Help and Support program opens. Click Troubleshooting from the opening screen. 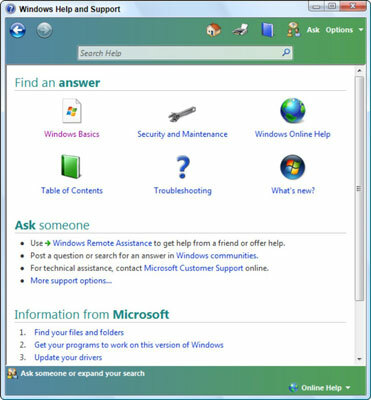 The Troubleshooting icon lives in the Find an Answer section of the Help and Support program’s opening screen. The Troubleshooting in Windows page is ready to tackle a wide variety of problems. Click a topic, and Vista whisks you to the page dealing with that subject’s most common problems. Keep clicking the subtopics until you find the one dealing with your particular problem. Networking: This topic offers help on finding wireless “hotspots” for connecting on the road, fixing home networks, and troubleshooting network and Internet connection problems. Using the Web: Here’s where to find help with Internet connections, including sharing one connection with several PCs. E-mail: This area covers Windows Mail and attachments, as well as sending pictures and video through e-mail. Hardware and drivers: When something’s wrong inside your PC, Vista can show the symptoms. This area shows how to diagnose driver problems, the biggest cause of bickering between Vista and things plugged into or inside your PC. Your Computer: A catchall section for everything else, this helps out with security and improving your PC’s performance. Most of the time, you’ll stumble onto numbered steps that solve your problem. Follow the steps one at a time to finish the job. The Windows Help and Support program works much like a Web site or folder. To move back one page, click the little blue Back arrow in the upper-left corner. That arrow helps you out if you’ve backed into a corner.